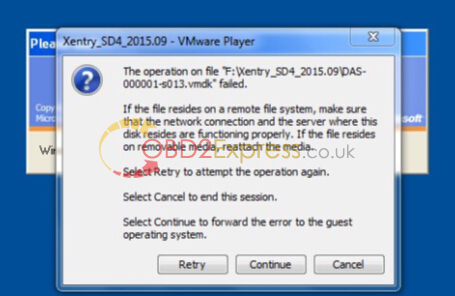 “The operation on file “F:\Xentry_SD4_2015.09\DAS-000001-s013.vmck” failed. The user had used it in another computer and did not close it. The VMware is broken, ask the seller for a new one. With the long-time test by Star diagnostic technicians, Windows XP will be the most ideal operation for star mux, including MB STAR C3 and SDconnect C4. Also, it will be better to spare a laptop to install Mercedes software for diagnosis or programming. No need a brand new PC. Second hand PC(Dell D630) is just okay.